Housed in the stylish boutique hotel Artist Residence, Cambridge Street Kitchen is a relaxed and well-priced all-day eatery, located on a leafy residential street of Pimlico. With a new head chef, Cambridge Street Kitchen boasts a changing monthly menu using seasonal, quality British ingredients in a fresh way. Breakfast and brunch menus offer the ubiquitous trendy toast varietals: you’ll find both the standard-issue Avocado Toast (£11), as well as the more creative Chorizo Toast (£13), jazzed up with poached eggs, crushed avocado and tomato relish, as well as popular skillet dishes (£13-£14). 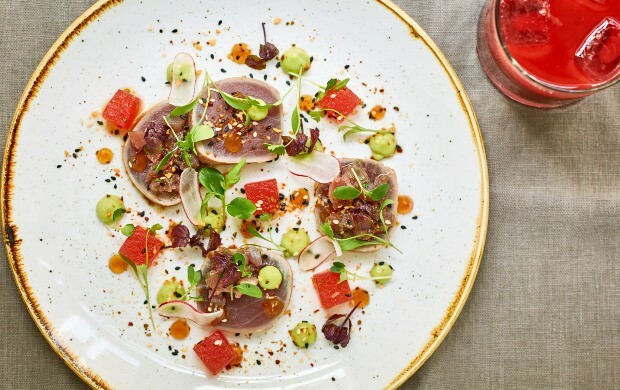 At night, the rustic, almost beachy space becomes intimate and cosy with candlelight and a more refined menu, containing offerings such as a prettily pink Tuna Tataki starter (£11) and a buttery-rich Guinea Fowl main (£24). There’s also a “hidden” subterranean cocktail bar where you can enjoy an inventive nightcap. The charming candy-stripe awnings outside and the high-ceilinged, airy interiors give Cambridge Street Kitchen a distinct daytime, brunch-y vibe. Only a copper bar separates the dining space from the open kitchen, giving diners—seated at reclaimed wood tables and upcycled fabric banquettes—a peek at the action. Bright, eclectic artwork in the vein of limited-edition works by Miles Aldridge, Tommy Clarke and Harland Miller adorn exposed brick walls and Edison bulbs dangle down from high overhead; the effect is rustic and fun. I get the whole shabby chic thing, but upon further inspection, a few elements were just plain shabby: a chair leg barely held together with packing tape and menus that looked produced by a printer about to run out of toner (both of which are easily remedied, and didn’t hugely detract from the atmosphere). Though it was Friday evening when I visited, the place seemed skipped over by the Victoria after-work crowd, instead favoured by couples on date nights and pairs of friends. Between eight and nine the joint goes from nearly empty to almost full, with an easy, chatty feel that both the kitchen staff and service crew got in on. Service is friendly and sort of adorably scattered and laid back. But it’s cool: the customers—locals in interesting eyewear and relaxed-but-still-cool garb—aren’t in a rush either. A bespoke neon yellow sign over the open-plan kitchen reads “This is where the magic happens,” and honestly, I couldn’t agree more. Head Chef Elliot Miller’s menu of seasonal local goodies is both creative and comforting—and most importantly, delicious. My roasted quail starter, for example, was served with silky foie gras, sweetcorn, pine oil—and popcorn. And it worked. My main course, sirloin with Anya potatoes and tenderstem broccoli, was also topped by malted shiitake and smoked anchovy butter, giving the perfectly cooked steak a creamy, melt-in-your-mouth oiled finish. Everything was interestingly and lovingly prepared with real thought, showing an undeniable knack for combining flavours. With the obvious quality of the raw ingredients, Cambridge Street Kitchen presents good value for money, but with mains starting at £20, I wouldn’t call it wildly affordable. I would, however, call it totally worth it. Cambridge Street Kitchen presents a geographically diverse wine list with plenty of options, ranging in price from £25 for a “super easy drinking” Tempranillo (couldn’t agree more) to £65 for Dos Dedos de Frente, a Syrah Viognier, described as a “full bodied, complex wine perfumed by black fruits, cassis, cedar, cigar and violet.” Each dish is paired with a suggested glass of wine. Downstairs, in the Clarendon Cocktail Cellar, the age of the crowd took a downward drop and the décor started to lean toward Shoreditch arty-grunge. Millennials with man-buns and on-trend facial piercings ordered fussy-but-fun concoctions inspired by nouveau cult classic movies (think: Titanic, Lost in Translation, and Kill Bill). My pick? The Departed: Teeling Irish Whisky, Blackwell’s Jamaican Rum, Bärenjäger Honey Liqueur, Cranberry and Cinnamon Syrup, Absinthe, and something like five more ingredients—which, once combined in a copper mug, is then sprayed in edible gold. I have to admit, behind all that style, there was substance: The Departed was highly drinkable. A vibe-y and comfortable neighbourhood restaurant with inventive, ever-changing seasonal dishes that will have you coming back to see what’s new.